Location: Budapest, Bartók Béla út 29. The project SRIAT, organized by Igor Metropol Association in collaboration with the Intermedia, the Art Theory and Curatorial Studies Departments and TransPraxis – International Center for Art and Theory, of the Hungarian University of Fine Arts in Budapest, calls for young artists, and students of fine arts, curatorial or similar studies to reflect upon the intersections of art and social responsibility. We invited the German artist Thomas Kilpper to hold a 2 week long practice-oriented workshop questioning the complex role(s) of artists within current societies. Freedom of Expression, Activism in Art, Socially Engaged Art and it’s relevance within the art (world) is not only a matter in Hungary with its current developments, but also a global and general topic on contemporary art. Based on the experiences of recent projects by Kilpper, such as “Pavilion for Revolutionary Free Speech” at the 54. Venice Biennial or “State of Control” at the former GDR State Security Headquarter, the starting point of the workshop will be the topic of “Freedom of Speech” in democratic and other constructions of society. The group will research and develop different strategies of artistic involvement within these systems, starting with a field study in the public space of Budapest on October 23rd, National Holiday of commemorating the Hungarian Revolution of 1956. Developing new and experimental art-practices, the result of the collaborative work will be shown in a public exhibition. Working and exhibition space of the project is an ex-Chinese restaurant in the new emerging cultural street, Bartók Béla út, in a house, which also used to be the home of László Almásy. This particular interesting location will also provide material for artist interested in site-specific projects. During the workshop period, there will be two meetings with Hungarian artists Miklós Erhardt and Tehnica Schweiz (Gergely László/Péter Rákosi). These internal meetings give the opportunity to get acquainted with their artistic approach, to support the exchange of artistic perspective in an informal and personal way. A public discussion on the issues raised during the workshop will take place at the Ludwig Museum on the 6th November. Workshop schedule: October 24th (Wednesday) – November 5th (Monday), 2012. The first meeting will take place on October 24th, from 10 a.m. till 5 p.m. and is mandatory for all participants. Further meetings during the 2 weeks will be scheduled on that day. The common work requires a regular presence of the participants on weekdays. The workshop is open for students and young artists from all fields and media. If you are interested in participating (or you require more information) please send your application in pdf-format to: info@igormetropol.org. 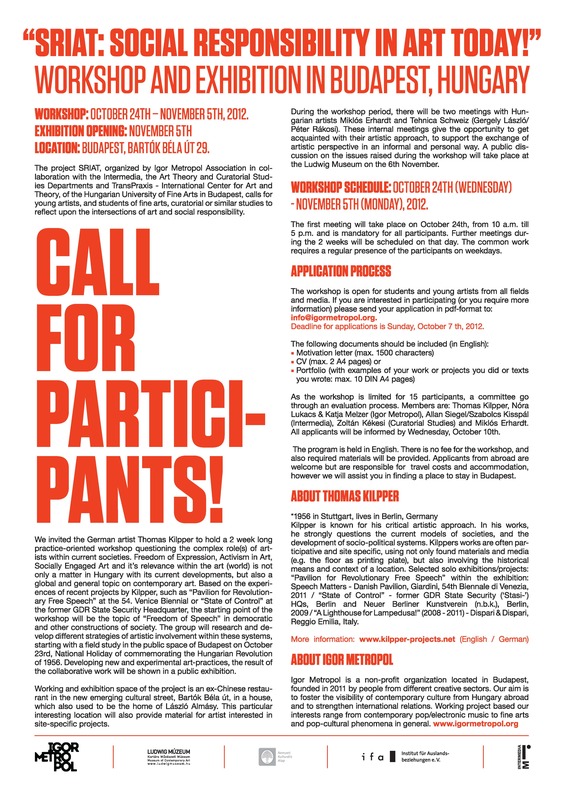 Deadline for applications is Sunday, October 7 th, 2012. As the workshop is limited for 15 participants, a committee go through an evaluation process. Members are: Thomas Kilpper, Nóra Lukacs & Katja Melzer (Igor Metropol), Allan Siegel/Szabolcs Kisspál (Intermedia), Zoltán Kékesi (Curatorial Studies) and Miklós Erhardt. All applicants will be informed by Wednesday, October 10th. The program is held in English. There is no fee for the workshop, and also required materials will be provided. Applicants from abroad are welcome but are responsible for travel costs and accommodation, however we will assist you in finding a place to stay in Budapest. Kilpper is known for his critical artistic approach. In his works, he strongly questions the current models of societies, and the development of socio-political systems. Kilppers works are often participative and site specific, using not only found materials and media (e.g. the floor as printing plate), but also involving the historical means and context of a location. Selected solo exhibitions/projects: “Pavilion for Revolutionary Free Speech” within the exhibition: Speech Matters – Danish Pavilion, Giardini, 54th Biennale di Venezia, 2011 / “State of Control” – former GDR State Security (‘Stasi-‘) HQs, Berlin and Neuer Berliner Kunstverein (n.b.k. ), Berlin, 2009 / “A Lighthouse for Lampedusa!” (2008 – 2011) – Dispari & Dispari, Reggio Emilia, Italy.